John Teel highlights the importance of family traditions. 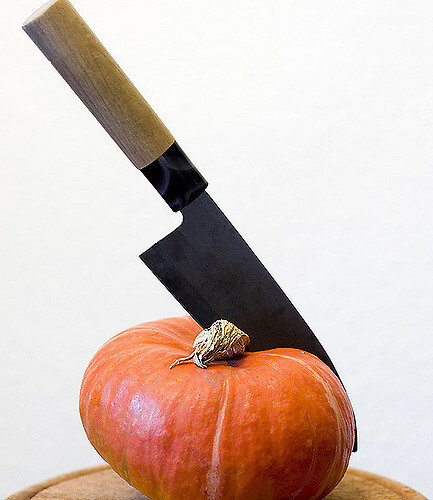 Cole gripped the side of his pumpkin and drove the butcher's knife into the tough flesh, stabbing a circle around the stem. He set the knife aside and gave the stem a tug, hearing that familiar sucking sound as the top pulled free. Pulp hung from the bottom like orange entrails. Every Halloween, he woke up early, drove to the supermarket, and bought pumpkins of different shapes and sizes (twenty this time, one for every year). With his phone and laptop turned off, he popped the first of many horror movies into the DVD player and spent the rest of the day carving them into jack-o-lanterns. This was how it was always done. This was his father's tradition. Using a spoon, he scooped the guts out of the pumpkin and dropped them into a large container. When that was done, he carved the jack-o-lantern’s face: two triangles for eyes and one for a nose. He finished it off with a sharp-toothed grin. Cole's grin grew wider. It was perfect. "Nineteen more to go," he muttered. On the TV behind him, Dr. Loomis explained how Michael was pure evil. The sun had just begun it’s slow descent behind the treetops as Cole finished up the last of the pumpkins. He positioned a few on each side of the steps leading up to the porch and sat the rest together on his glider. He lit a candle for each, their glowing faces welcoming the inevitable pleas of trick or treat. Cole placed a plastic cauldron of candy on the porch table. It all looked perfect. The same as last year. The same as every year as far back as he could remember. Cole looked out at the street and breathed the air in. It was a chilly night with the faint aroma of burning leaves. He could hear the excited voices in the distance. The wind touched the dying leaves on the branches and they danced back and forth, some of them coming loose and twirling to the sidewalk below. Cole went back in the house, greeted by the screams of promiscuous teen slaughter blaring from the television. It was music to his ears. In the kitchen, he collected a few things: his knife, a candle, and the container filled with all of the discarded pumpkin pulp. He carried it to the basement door and opened it. Behind it was another door with many locks, bolts, and chains. He unlocked and unlatched them all, making his way into the dank basement that stunk of mildew and dust. A table was set up in the middle of the basement. He placed his things down and stripped to his underwear. By the far wall was a plastic tote filled to the brim with all of his old costumes and decorations. He pulled out a Grim Reaper mask with hologram eyes and a black hood. It was the costume he'd worn when he was ten-years-old and every Halloween since. Now it barely fit. His chin and lower lip stuck out from the bottom of the mask. This was the way Daddy wanted it. This was the way it was always done. He walked back to the table and collected the knife, shivering as the chilly air cut through his skin. There was a shuffling noise by the workbench. The boy was finally awake. He no longer looked like the skinny little kid Cole had picked up on the first day of October. The candy and junk food he'd been force-fed had plumped him up good and round. The boy’s torso was duct-taped tight around the sturdy wooden leg of the work bench. His belly was swollen from the constant junk food stuffed down his gullet. Cole waded through a sea of candy wrappers, sliced the tape, and hoisted the boy onto his shoulders with ease, gently laying him on the table. He taped his forehead and legs down. He readied his knife and got to work. After the boy’s belly was opened up and all of the pumpkin pulp was stuffed in, Cole used his circular saw to cut out the top of the kid's head. Popping the piece of skull out with a flat-head screwdriver, Cole fastened a pumpkin stem to it with super glue. He hollowed out the head the best he could, then took his knife and made the little face into a jack-o-lantern. It was hard work, but his knife was sharp and he'd had years of practice under his belt. The kid was long gone, so Cole cut him loose and propped him up against the cold, stone wall. He stood back and admired his work. Orange pulp bulged from the kid’s belly. He looked like a pumpkin a squirrel had gotten into. Cole placed the skull piece with the stem back on top of the boy's head. Cole lit a candle and inserted it into the boy’s open mouth. The light flickered and a pale orange glow illuminated the crudely-carved face. Cole took his mask off and picked up a Butterfinger from the floor, unwrapped it, and popped the bite-sized chocolate into his mouth. “Happy Halloween,” he said, watching the flame dance inside the boy's mouth. John Teel is a union ironworker from Philadelphia. His work has appeared in Pulp Modern, Shotgun Honey, Dark Moon Digest, and The Literary Hatchet. When he isn't working he's spending his time with his two kids and the ugliest rescue dog you've ever seen.